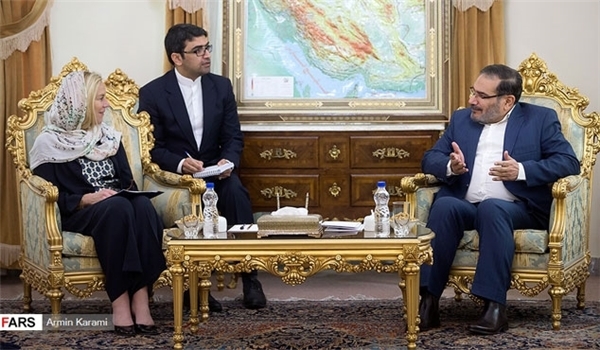 Secretary of Iran’s Supreme National Security Council (SNSC) Ali Shamkhani warned of the US dangerous policies against global peace, adding that Washington is resuscitating the terrorist groups in the Middle-East and North Africa. “The US national security strategy and nuclear doctrine in the new era is a serious threat to global peace and violates the UN Charter, and all deterrent measures are required to prevent this madness,” Shamkhani said at a meeting with Dutch Foreign Affairs Minister Sigrid Kaag in Tehran on Wednesday. In relevant remarks earlier this month, Iranian Parliament Speaker Ali Larijani warned that the US had transferred the ISIL terrorists from Iraq and Syria to Afghanistan to create new problems for Iran. “The US has transferred the ISIL from Iraq to Afghanistan to cause problems in Iran again but the Iranian nation will foil all these plots with the guidelines of Supreme Leader of the Islamic Revolution (Ayatollah Seyed Ali Khamenei),” Larijani said. Also, late in January, Ayatollah Khamenei expressed deep regret over the massacre of the Afghan people in the recent terrorist attacks, blaming the US for the tragedies by transferring the ISIL terrorists to Afghanistan to guarantee its presence in the region.